Steve Bannon Out At Breitbart News : The Two-Way The move had been rumored following the publication of Fire and Fury, which included quotes that were embarrassing to President Trump. Steve Bannon, former strategist for President Trump, has left his job at Breitbart News. Breitbart CEO Larry Solov said, "Steve is a valued part of our legacy, and we will always be grateful for his contributions and what he has helped us to accomplish." "I'm proud of what the Breitbart team has accomplished in so short a period of time in building out a world-class news platform," said Bannon. 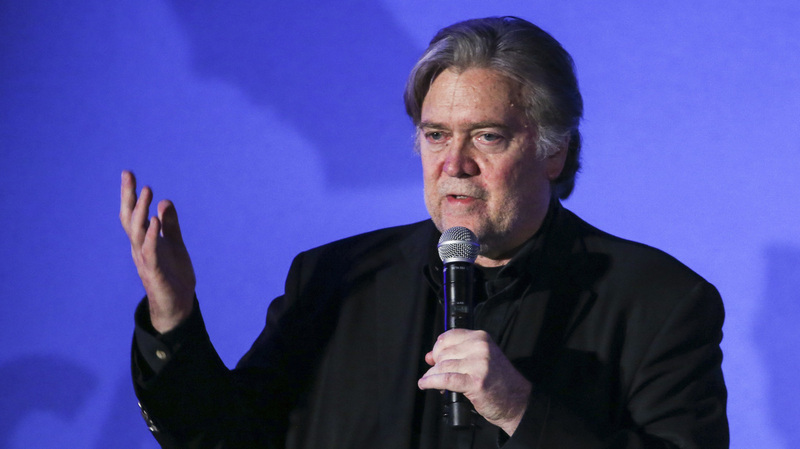 But the end of Bannon's tenure at Breitbart came amid tension between the White House and the former strategist who had fashioned himself as the general leading the rebellion against the GOP establishment on Trump's behalf. Bannon was named executive chairman of Breitbart News in 2012. He joined the Trump campaign in August 2016. When he left the White House a year later, Bannon returned to Breitbart, which he had called a "platform for the alt-right." He later called the alt-right "a collection of clowns." In Wolff's book, Bannon was quoted as saying, among other things, a meeting of Donald Trump Jr. and other Trump associates with a group of Russians at Trump Tower during the presidential campaign was "treasonous." Suddenly, the operative who once enjoyed ultimate insider status in the West Wing and sat in on National Security Council meetings found himself on the outside being ridiculed by Trump as "Sloppy Steve." "Brietbart certainly defined his job as being something of a rhetorical bombthrower, usually aimed at the left or those within the Republican and conservative establishments that he saw as insufficiently devoted to his brand, and his version of conservatism. "The Mercer family, Robert Mercer, had been a major funder, had sold his stake in November in Breitbart to his daughter Rebekah Mercer, who remained one of the owners, issued a statement saying "the writing was on the wall." "Donald Trump - and this is - if you say this around the president, the top of his head blows off. But this is absolutely true, that Steve Bannon is responsible for Donald Trump's election. And Steve has a singular vision about where he thinks the country should be and what has to happen to make America great again. And that's what he went into this White House to do. "You know, and he thought Donald Trump was his vessel to do this. But his vessel turned out be, as Bannon has described him, but as everyone - singularly, everyone else in the White House has also described him - his vessel turned out to be a child or to be like a child, a man so desperate for immediate gratification that really nothing could get done." Bannon had apparently hoped to weather the storm of criticism from fellow Trump loyalists. "Bannon's departure from Breitbart came as a shock to some of his allies. One said Bannon was telling people as recently as Monday that he expected to stay on," reported the Associated Press.